Contrary to popular belief, money wasn’t invented to replace the barter system. Have you noticed how bartering comes very naturally to children? Perhaps you remember exchanging a juice box for some cookies, or your best set of marbles for a Matchbox car. One old and popular theory holds that money was “invented” as societies outgrew the barter system. In fact, this theory dates back to Aristotle. Though it was essentially pure speculation, the theory gained traction with many great thinkers who followed, including the influential eighteenth-century economist, Adam Smith. They all believed that money was an outgrowth of commercial trading – where, for example, some valuable bit of property such as cattle could be traded for a certain number of slaves. But this isn’t very efficient; things like cattle aren’t very easy to transport, whereas coins are. Plus, the precious metals in coins were seen as being valuable just about anywhere, while other goods may not be in demand in some areas and are therefore less valuable. This idea of money evolving from bartering may sound plausible, but it’s actually been debunked. In 1913, Alfred Mitchell-Innes, a British economist, published his own findings, noting that there was no evidence in commercial history to suggest that a barter-only system ever existed. And Mitchell-Innes has yet to be proven wrong – in fact, historians have only gone on to find more evidence of ancient civilizations using old forms of money in addition to bartering. Around 5,000 years ago, in Sumer, one of Mesopotamia’s earliest urban civilizations, commercial transactions were recorded on clay tablets, which show us that salt, beads and bars of precious metals were all used as early versions of money. The truth is, we don’t know exactly how or when money came to be used, but we do know that the first coins began appearing in the seventh century BC, in the Mediterranean kingdom of Lydia. And by the sixth century BC, Greek city-states were minting their own coins as a demonstration of power and independence. Determining the value of money reveals its complex nature. Banking and international trade flourished after the invention of debt. The gold and silver riches of the New World significantly changed the world economy. The ability to print money led to certain problems, but a stable economy eventually emerged. Economic theory has changed over the last few centuries, and it’s come to include psychological aspects. Economists and politicians have discussed and tried various methods to deal with monetary crises. 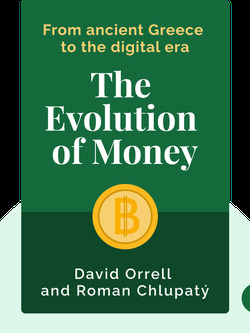 Bitcoin has changed the present status of monetary systems – and the future has many challenges. Start your free Blinkist trial to get unlimited access to key ideas from The Evolution of Money and over 3,000 other nonfiction titles. With bitesize text and audio, it's easier than ever to find the right ideas to transform your life.